Our popular Jack the Joker Fundraiser will continue this Sunday night in Kennedy’s Live where the Jackpot will be €4,000 as on Sunday night Carmel and Jim were drawn out of the drum and picked card 19 which wasn’t the Joker though they did win €50. Mary Power and Richard Cosgrave won €25 each. As well as our group of ticket sellers tickets can be purchased from Convenience Store Ballinroad, The Village Inn, Village Flowers, Kennedys Live, Spar, Mike Kiely’s Butchers and Mousies Takeaway. This Sunday our Club Bingo continues in the CBS Hall at 8:30 pm where the jackpot is €400. On Sunday last we took on Fourmilewater in the first round of the County Championship where a most disappointing performance saw us defeated by seven points. This Sunday we play De La Salle in Walsh Park at 3:30 pm. TEAM: S. ENRIGHT, B. LOOBY, S. O’HARE, J. POWER, S. O’DONOVAN, J. O’MAHONY, J. HURNEY, M. O’HALLORAN, M. POWER, S. CROTTY, M. FERNCOMBE, M. FIVES, M. GORMAN, P. HURNEY, D. COLLINS. SUBS: R. FOLEY, T. MURRAY, G. HURNEY. On Sunday night last we played Brickey Rangers in the first round of the Western Championship in Colligan where a team comprising some of our younger club players gave a good account of themselves in a defeat to a stronger Bickey Rangers outfit. This Friday night we play Ring in Bushy Park at 7:30 pm. TEAM: L. POWER, S. O’CONNOR, G. BREEN, L. BERESFORD, R. SHEEHAN, P. LYNCH, C. PRUNTY, E. BERGIN, J. DUGGAN, E. ENRIGHT, L. HURNEY, C. KINDREGAN, S. CLIFFE, S.DALY, R. RYAN. SUBS: J. O’BRIEN, J. MOORE, B. HENLEY. This Monday we play Colligan in Fraher Field at 2pm in the Western Championship. The first Deise Draw for 2014 took place on Friday night last and we had two winners on the night. Claire and Dennis Murray won €400 and Michael and Noreen Brackett won €300. We would like to thank all those who purchased tickets for the draw as we are delighted with the fantastic response our loyal supporters gave the draw. We are delighted to report that there has been a truly fantastic response to our Fundraising Cycle from Limerick to Abbeyside. Liam O’Connor and his group of helpers have done a huge amount of work to date and now have the 24 cyclists signed up for the full cycle which is the maximum amount allowed to do the full cycle due to health and safety guidelines. The second leg of the cycle is from Cappoquin to Abbeyside and this part of the cycle is open to all club members and supporters, whilst the last leg of the cycle will be from Quills to Abbeyside and it is hoped that as many as possible of our members both young and old will join the cycle there, to give the 24 brave cyclists who are doing the full cycle, a final push for home. Liam informs us that the formal launch for the cycle will be taking place in late June in our pitch and we will have more details on this closer to the time. In the meantime anybody who has any questions on the cycle or who would like to volunteer to help in anyway should contact any of the people listed below. This event promises to be a huge success and we urge all our supporters and members to lend a hand in whatever way you can. Liam can be contacted at 0851191908 or liam.oconnor@augh.com, Michael can be reached at michealcosgrave@hotmail.com or 0877682068, Benny can be contacted at benny.i.flynn@gsk.com or 087-9352716 while Beanie can be reached at liambyrnebeanie@yahoo.com or 087-6436046. The latest round of the Western hurling and football league was played last week with a trip for group two to Tallow (Tues 22nd) and group one travelled to Lismore (Wed 23rd). Group two played great hurling and recorded a fine victory on the night while the boys in group one found the going much tougher against a fine Lismore set up. Monday gone (28th) saw both teams play the same opposition in football in Abbeyside. Details next week. Our under 8 hurling team played against Fourmilewater on Sunday last in the Fraher Field at half time in the match between the same two teams at senior level. All players acquitted themselves well before a large attendance .Well done to all. Our underage outdoor hurling commences this Saturday morning the 3rd May at the Burgery at 10. 30 Am. All are welcome. This covers all age ranges from under 5 to under 10. Anyone who has not paid their membership yet is asked to pay it on the morning for insurance reasons. Membership forms will also be given out on the morning. Helmets are compulsory and there will be a €2 cost to cover expenses. Our under 16 footballers were due to play their last match in the round robin series of their football county championship last night, Tuesday 29th of April in Abbeyside against Gaultir. Going to print no score was available but will be covered in next week’s notes. Our under 14 Footballers played in the Féile football county final last Wednesday night against the Eastern champions De La Salle in Walsh Park. Playing with the breeze in the first half we were slow to get going, as the half progressed we settled in well and were 1-4 to 0-0 up at half time. In the second half we played much better and went on to record a good win 2-10 to 0-2. This was a great achievement for this panel of players, who now go on to represent the county in the Féile national championships. This is the second consecutive year that the club has qualified for this tournament. Plans are underway to fundraise to send the panel to Mayo for this year’s competition on the 27th June. Panel: Jake O’Riordan, Eoin Ahearne, Danial Raher , Sean Kent, Fergal Roche, Johnny Treen, Meldan O’Dwyer, Eoin Flynn, Shane Kiely, Dathi Brunnock, Jamie Walsh, Ben Flynn, Senan Travers, Cian O’Riordan, Michael Kiely, Sean Roche, Barry Morrissey, Rory Ahearne, Patrick Fitzgerald, David Hayes, Michael Troy, Oisin Hallahan, Danny Reynolds, James Riordan. On Saturday morning we switched to hurling for the Western Féile semi final against Lismore. This was a much tougher game and with less than 10 minutes to go we were one point down but boys battled away well and won 3-5 to 1-7. Our under 13 are out next weekend in the Football Western Semi Final against the Nire. Training continues this Friday night at 6.30 to 7.30 for all age groups, and from 6.00 to 7.00 for U12. Our under 8s and 10s take part in their first blitz for 2014 in Portlaw on Saturday 3rd of May meeting at Abbeyside pitch at 9.45am to travel to Portlaw. Congratulations and well done from all in the club to the Waterford minor camogie team who claimed an All-Ireland title last weekend. A big shout out to Cadhla McGrath who was part of the panel, daughter of Sean, coach to our U14/16 girls. Click here to see pictures of Abbeyside's County Senior Hurling Championship match against Fourmilewater on Sunday last. Many thanks to Seán Byrne Photography for providing us with the photos. 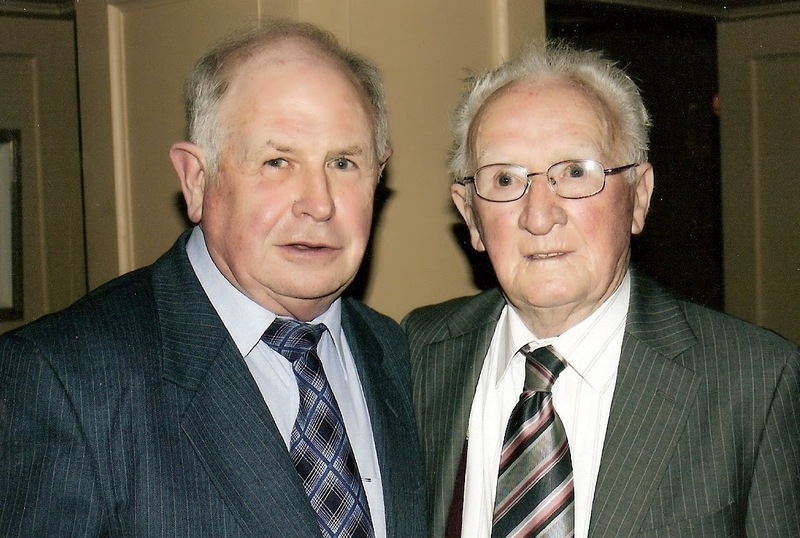 This week's photo comes from 2010 and marks the retirement of Séamus O'Brien from the Central Council of the GAA. Séamus made an outstanding contribution to the Association at club, divisional, county, provincial and national level throughout his life. Our popular Jack the Joker Fundraiser will continue this Sunday night in Kennedy’s Live where the Jackpot will be €3,820 as on Sunday night Siobhan O’Mahony was drawn out of the drum and picked card 29 which wasn’t the Joker though she did win €50. Barry Goode and Martin Lavan won €25 each. As well as our group of ticket sellers tickets can be purchased from Convenience Store Ballinroad, The Village Inn, Village Flowers, Kennedys Live, Spar, Mike Kiely’s Butchers and Mousies Takeaway. On Saturday evening last we took on Ardmore in the second round of the County Championship and recorded a good win on a score of 4:10 to 1:08. TEAM: S. ENRIGHT, B. LOOBY, R. SHEEHAN, S. BRIGGS, C. MOLONEY, S. O’HARE, D. COLLINS, J. HURNEY, J. O’MAHONY, M. FIVES, M. FERNCOMBE, S. O’DONOVAN, G. HURNEY, M. GORMAN, P. HURNEY. SUBS: J. O’BRIEN, J. POWER. This Sunday our Club Bingo continues in the CBS Hall at 8:30 pm where the jackpot is €1550. We play Fourmilewater this Sunday afternoon at 2pm in Fraher Field in the first round of the County Championship. This Sunday we play Brickey Rangers in the first round of the Western Championship at 7pm in Colligan. On Wednesday last Waterford Minor Footballers were narrowly defeated by Tipperary in the Munster Championship where Kevin Dwane and Conor Prunty were on the team while Stephen Cliffe and John Elstead were on the panel and Gary Hurney is a selector with the team. On next Wednesday they take on Clare or Limerick where a win would see them qualify for the Munster Semi Final and we wish them the very best of luck. The U9's continued the Western U9 hurling & football league with football on Monday 14th. Our boys in group 2 played Dungarvan on a beautiful evening at the Dungarvan club grounds and came away with another draw 4-0 to 3-3 (we drew in the hurling the week previous). The boys in group 1 played Naomh Brid at Abbeyside and won easily on the night. The league continues on Tuesday 22nd (hurling) in group 1 away to Cois Bhride and tonight Wed 23 a visit to Lismore in group 2. Report in next week’s notes. Well done to our under 16 football team who beat Lismore at the weekend in the western championship. This win makes the possibility of making the knockout stages of the competition much stronger than the previous week. The county football Feile final takes place tonight Wednesday 24th April at Walsh Park against De Le Salle beginning at 7 pm. We wish all players and mentors the very best of luck in this. Our under 13 football team played on Monday night last against the Nire. After a hard battle our boys pulled away in the second half to win easily. This was a great performance from everyone involved and hopefully many more good displays are down the tracks for this very talented group of players. Training will be back on Friday 25th April at 6.00pm to 7.00pm for U12 and 6.30 to 7.30 for all other age groups. 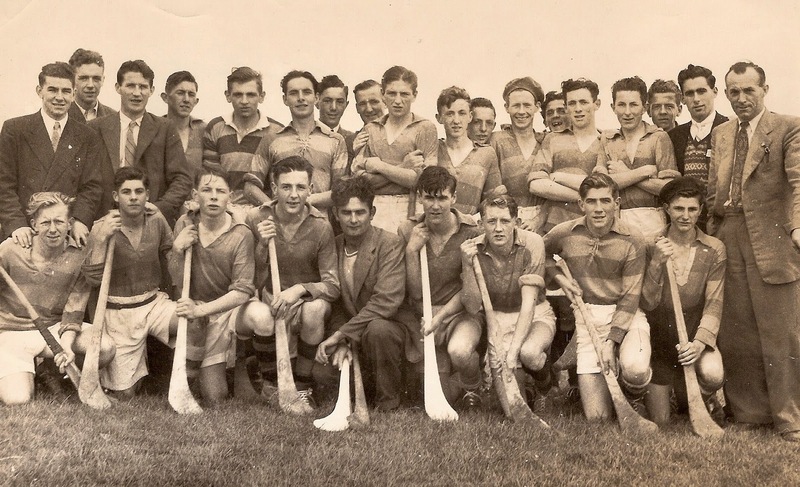 This week's photo shows the Abbeyside Minor Hurling team, mentors and supporters that won the Western title in 1950. The boys beat St. Malachy's by 5-4 to 3-5 at Lismore to secure the first divisional crown at this grade for the Village. Some in the picture are Maurice McHugh, Johnny Byrne, Austin Flynn, Mikie McGovern, Gary Morrissey, Anthony Hayes, Johnny Hogan, Michael Fives, Noel McHugh, Roger McCarthy, Danny O'Connor, Gerry Flynn, Michael Farrell, Paddy Browne, Tom Collender. Our popular Jack the Joker Fundraiser will continue this Sunday night in Kennedy’s Live where the Jackpot will be €3,660 as on Sunday night Sharon Kiely was drawn out of the drum and picked card 14 which wasn’t the Joker though she did win €50. Claire Cosgrave and Liam Bannon won €25 each. As well as our group of ticket sellers tickets can be purchased from Convenience Store Ballinroad, The Village Inn, Village Flowers, Kennedys Live, Spar, Mike Kiely’s Butchers and Mousies Takeaway. On Sunday afternoon last we took on Rathgormack in the first round of the County Championship and recorded a good win on a score of 1:09 to 0:09. TEAM: S. ENRIGHT, B. LOOBY, R. SHEEHAN, S. BRIGGS, C. MOLONEY, S. O’HARE, J. RYAN, J. HURNEY, J. O’MAHONY, M. FIVES, M. FERNCOMBE, J. POWER, M. O’HALLORAN, J. O’BRIEN, P. HURNEY. SUBS: S. O’DONOVAN, G. HURNEY, M. GORMAN, D. COLLINS. This Saturday evening we take on Ardmore in Bushy Park at 7pm. This Sunday our Club Bingo continues in the CBS Hall at 8:30 pm where the jackpot is €1500. Our Intermediate footballers got their Championship campaign off to a good start on Sunday evening last when they defeated Geraldines in Bushy Park. This Sunday night they take on Sliabh gCua in Colligan at 7pm. TEAM: R. RYAN, G. BREEN, M. LAVAN, S. O’CONNOR, N. DEE, P. LYNCH, E. BERGIN, L. HURNEY, R. DUNFORD, M. MAHER, J. MOORE, L. MULHEARNE, T. MURRAY, C. KINDREGAN, D. FERNCOMBE. SUBS: S. CROTTY, E. ENRIGHT. We would like to congratulate the Waterford Minor hurlers on their Munster Championship victory against Clare on Wednesday night last in Ennis. Conor Prunty was wing back on the team and Sean Daly was on the panel while Donnacha Enright and Pat Moore are members of the backroom team.